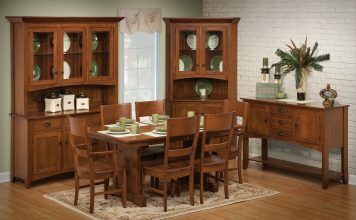 The Amish Dining sets pictured below represent just a few of the options available to you. Even more choices can be found by viewing the Amish Tables, Amish Chairs and Amish Hutches categories located on the left. All these sets and pieces feature solid wood crafted in the Mission style with the utmost quality our customers have come to know and expect. If you’re having trouble finding a Shaker set you love, please feel free to contact us at 1-800-217-6999 and we will help you put together the Amish set perfect for your home. Decide what hue you want for your set. Whether you prefer a darker grain to offset a lighter-hued dining room or you want a light grain to complement your dark floors, you can eliminate much of our selection based on your preference. Pick a shape for your table. If you really love rectangular Amish dining table sets, then there’s no reason to even consider the circle ones. Listen to your instincts. Most likely if a table doesn’t feel like the right fit, it won’t be. Make sure it will accommodate your guests. You need a table that’s big enough to fit your family as well as a few guests. Most families don’t use their dining furniture for day-to-day meals but rather for when others come to visit. Keep that in mind and get a little more space than you think you need. Many people have dining rooms on the small side, and they worry about getting a table that will feel overwhelming in that limited space. We have options that will fit whatever space you have available, and it’s easy to make sure the dimensions of your new table are ideal. First, measure the length and width of your dining room. Next, get out a sheet and fold it so it matches the length and width or diameter of your table. Put the sheet in the center of the room, and you can decide whether you need a smaller table or if the one you’ve picked out is small enough. How Long Do Solid Wood Amish Dining Room Sets Last? Our dining sets have been constructed to last for a very long time. The high-quality Amish craftsmanship ensures a product that is built to last. Our dining sets are sturdy and durable, and they’re made from wood that won’t rust or corrode, unlike metal tables. Think of our pieces as a long-term investment. You won’t need to replace them for years. We stand behind our work and know many customers who have raised an entire generation at our tables without notable wear or tear. 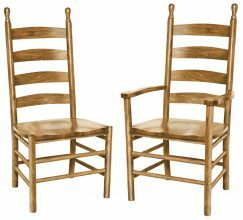 How Do I Match My Décor to My New Amish Dining Room Furniture in Solid Wood? Our dining sets are handmade by Amish artisans who follow a traditional manufacturing process befitting of these classic furniture pieces. These skilled craftsmen use the finest hardwoods such as Oak, Cherry, Q.S. White Oak and Maple to create furniture masterpieces that typically become cherished family heirlooms. Take a closer look at all of our gorgeous solid wood dining sets by clicking on the individual product categories found on this page!